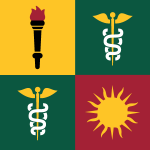 Originally designed by Dr. Jerome B. Walker for President James H. Zumberge’s 1981 inauguration, heraldic flags for each academic degree-granting unit are displayed at commencements and other academic convocations. These flags, carried by students, precede the faculty in the procession. By a long-standing tradition, most academic disciplines have used an identifying color, which is displayed on academic hoods to indicate the subject area in which the wearer obtained the degree. 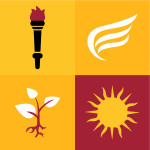 These identifying academic colors are used in the banners of the various schools and divisions of the university. 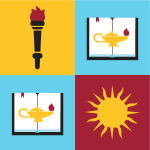 Found in the university seal, the torch of knowledge is a clear and honorable symbol, well suited to an institution of higher learning, and is one of the charges on the university’s official seal. 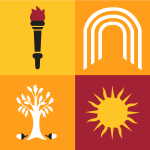 The university seal also contains a sun. Known as a “sun in its splendor,” it has a perimeter featuring alternating straight and wavy rays. The straight rays represent the light and the wavy rays the warmth and affection that the university extends to its students and community. 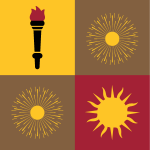 The torch and the sun are used to unite these disciplines under the flag of the University of Southern California. 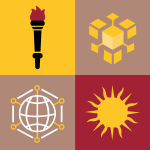 Academic colors: white for letters, gold for sciences. 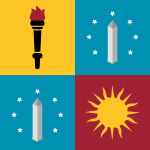 The wide-ranging fields over which this college functions are symbolized by the intimate intertwining of letters, arts and sciences in the heraldic pattern known as “gyronny.” The torch of knowledge serves as a reminder that the college is the academic heart of the university. Academic color: royal blue for the doctorate. 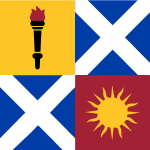 In heraldry, the saltire (a corner-to-corner cross) symbolizes the very wide range of disciplines over which this school presides and which the saltire unites in one unit. Academic color: blue-violet. The Doric portico is used here as a symbol of beauty and pro-portions inspired by the early Greek architects, who continue to inspire the architect today. The modern bridge represents progress, connections and stability. The blue background, representing the sky, suggests the almost limitless scope of architecture. Academic colors: brown for the arts, white for letters. Here the symbols reflect two important branches of art and design. The paintbrush and pencil symbolize fine arts such as painting, drawing and sculpture. The abstract symbol, with its pixel-like design, reflects the emergence and evolution of digital arts. Academic color: brown. The supernova, an astronomical event that occurs during stellar evolution causing the sudden appearance of a new, brighter star, represents the idea of disruption and the supreme energy exhibited by the founders and students of the academy. 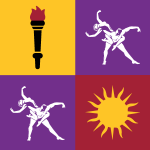 The flag’s additional colors are described in heraldic language as metals: gold and bronze. Academic color: white. The soaring sails symbolize confidence and agility in providing a student-centered approach to learning. The rooted plant is a symbol of the stability, growth and abundance of opportunity. 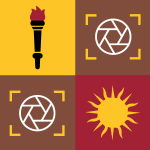 Colors featured in the flag are rendered as metals—gold, silver and bronze—in traditional heraldic terms. Academic color: drab. The square figures that are symmetrically arranged on this flag are designed to symbolize the organizational characteristics of business in all its complexity. The interconnected sphere represents an enterprising and global approach to business. Academic colors: brown for the arts, white for letters. The six triangles represent the strength of the individual specialties, such as camera, editing, sound, writing, criticism and aesthetics, that form the larger discipline of cinematic arts. When combined, they form an aperture, at the center of which is the human eye, representing the mediation essential to the discipline. 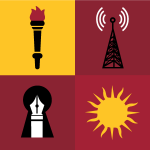 Academic colors: crimson for communication, white for journalism. The three data waves emanating from the transmitter in both directions symbolize the fact that all communication has a threefold aspect—communicator, audience and medium—all of which are involved in the interplay and sharing of a message. The quill tip within the keyhole represents freedom of the press. Academic color: amethyst. Dance is one of the oldest and most central expressions of humanity. The two interlocking figures represent creativity and innovation, and they capture the artistry of bodies in motion. The sun in its splendor represents the courage and power incumbent in authentic artistic creation, and white is the traditional heraldic color representing the arts and humanities. Academic color: lilac. 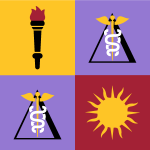 Dentistry, like the other scholarly areas associated with health care, uses the traditional Asclepian staff and serpent—in this case, enclosed in a capital Greek letter, delta, an homage to the official emblem of dentistry. 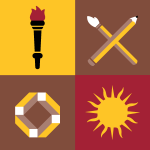 Academic colors: brown for the arts, white for letters. 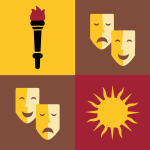 The classic emblem of comedy and tragedy is based on masks worn by actors in ancient Greek theater productions. They reflect not only the two main genres of the dramatic arts, but also the duality of the human experience. Academic color: light blue. The book, illuminated by the lamp of learning, is a very widely used, traditional symbol for education, and occurs in many shields of arms. 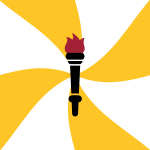 The flame from the torch of knowledge illuminates the tip of the lamp. Academic color: orange. 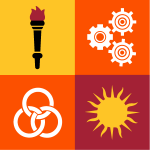 The interlinked circles, inspired by the classic mathematical Borromean rings, join the cogs and gears in this flag to symbolize the way in which the profession of engineering inter-acts with math and the applied sciences to solve society’s most pressing and wicked problems. Academic color: white. The very characteristic architecture of this school is incorporated in the flag, along with the oak tree, symbolizing sturdiness and longevity, and acorns, representing the constant renewal of life. Academic color: purple. 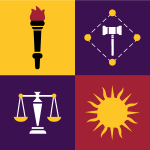 The four points surrounding the gavel in this flag symbolize the levels at which the legal profession provides a bulwark and framework for our society: federal, state, county and local. The scales of justice reflect the fair and impartial balance sought by the law. Academic color: green. 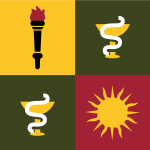 The staff of Asclepius, the Greek god of medicine, around which is entwined the harmless snake beloved of Asclepius, has been the symbol of medicine for many centuries. 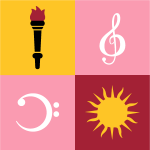 Academic color, pink. Music is a universal means of communication between human beings, linking the past, present and future. The treble and bass clefs symbolize music expressed in all its forms and styles, vocal or instrumental. Academic color: olive. Pharmacy is symbolized by the bowl of Hygeia, the Greek goddess of health, coupled with the Asclepian serpent, showing the intrinsic relationship between pharmacy and medicine. Academic color: peacock blue. 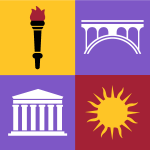 The school’s work is represented in triads, reflecting the intersection of three sectors, three levels of government, three locations and three levels of degree programs. The three shapes that come together to form the obelisk evoke those triads. The symbol of the obelisk surrounded by stars reflects structure, security and liberty. Academic color: citron. 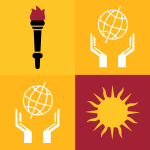 As symbolized by outstretched hands cradling the globe, social work by its very nature is about embracing our connections as human beings and inspiring the spirit of compassion and mutual respect that assists individuals and communities in reaching their full potential.